So you have decided to have a Birthday Party and are looking to make it one to remember - or you are thinking of hiring a magician for a youth party and wish to make it a magical event. There are many options for a party plan and it is not necessary to follow any single layout for a successful party. Planning prior to the party is necessary to get the most out of any entertainment provided. Bringing in an outside entertainer both relieves the person planning the party of having to come up with all the ideas as well as provides a unique aspect to the party that often becomes the talking point in the playground on the next school day. Shows include magic and illusions specifically aimed at children 4 years and older. For a children's birthday party a typical party plan could be to kick off with all the children playing as they want for the first 30 minutes - this gives an opportunity for them all to arrive. Planned party games can follow for around 30 minutes. 30 minutes to demolish the food followed by a 30 minute magic show to entertain the children. The cake cutting can take 10 to 15 minutes here with 15 minutes at the end for balloon folding to produce a gift that each child can take home. All up this will give between two and a half and three hours for the party, with only limited chaos at the front end as party-goers arrive and presents get ripped out of there wrappings. The 'magician' entertains the kids while the food disaster area is prepared for the cake ceremony, and the balloon animals go home as a gift from the party. The children will laugh with the comedy, fun and magic. Also entertaining for the 'older kids' that we sometimes call adults..
Magic juggling balls - I juggle them, and they juggle themselves, they may even disappear. Close up magic with simple items - coins, balls, rubber bands. Items come and go right before the children's eyes. Using the children in the audience to help me magically colour in my colouring book. 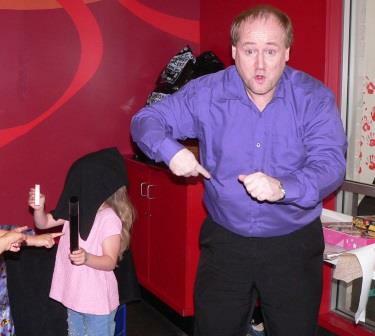 Making a hanky disappear from my hand, and reappear in the hand of a child from the audience. Balloon animals can be made for each child to have as a gift. Fun and games with a little Blue Bear. He's a rascal. Done in an entertaining and fun manner for the children. A number of children from the audience get to come up and help make the magic happen - some of the magic may even happen in their hands. The party should not only be fun for the invited guests, but also for the organising adults. The following survival hints will help. INVITATIONS: Include information on who or what the party is for, where the party is going to be, who the invitation is for, start (drop off) and finish (pick up) times, date of the party, special instructions (old cloths or swimming gear, fancy dress,...), reply information such as to who, by when, and how. HELPERS: A key ingredient to a successful low stress party is often having somebody to help - don't try and do it alone. An extra adult helper or two on the day takes a lot of the stress out of keeping things going. One can be managing the guests while the other is preparing for the next activity. Also the magician will concentrate on entertaining the group leaving one of the other adults to round up the audience and deal with any individual issues. TIME AND DATE: Consider the age of the party guests when planning the time of the party. Very young children are often tired by the end of a day so their parties are often best late morning or early afternoon. Those in their first years at school will handle a party up to late afternoon. Once children are 9 or 10 late parties become possible. When setting the time and date you might want to check when your helpers are available, and if a birthday party that your child's best friend is available. BEFORE THE PARTY: Don't leave too much for the day of the party. A few days before the main event buy all the food and decoration items you are thinking of using. If you are going to have a birthday cake arrange for it to be picked up or delivered a day before the party. If at home, the night before is a good time to blow up any balloons, make decorations, and prepare the place for the arrival of a bunch of young people who do not know the house rules like your own do. Also prepare the drinks and food that can be refridgerated overnight. Think safety as other children may not know not to go into that cupboard where the weed killer is kept. DON'T FORGET TO PLAN: Plan the party before it happens, what you are going to do, the games that will be played, what is your backup plan if the weather is bad. By planning the party you can then check that you have all the items that you need such as prizes for games - possibly wrapped in multiple layers of paper for that pass a parcel game. GIVE THE MAGICIAN SPACE: I will plan to arrive around 10 minutes before I start my show - this gives me time to set up. I will bring my own small table and carry box. All I need is a piece of flat floor to perform on. When I start my show I will want 1m of space in front of me so children I bring up to help have somewhere to stand. The children should be sitting as a group together - preferable on the floor or cushions. The children need to be in front of me - if they are to my side or behind me they will not be able to see some funny parts of the show. Thank you so much for making Rylies party extra special. Thank you for making Triston's party so special. Everyone loved the show. Thank you so much for a wonderful show - it was really enjoyed by everyone, especially the children, and the balloon animals were brilliant.